So in the ways of Black metal this is the very stripped down yet old school styling of bands like Dimmu Borgir, Old Mans Child, Emperor etc. There is an epic feeling to this with out being over the top symphonic black metal. The drones and monotone guitar elements makes this as cold and distant as you want any good black metal to be. There are spacial movements and blistering raw twists and turns as well. The vocals are very very grim in all fashion as add to the bleak and sorrow filled elements of the total release. We are not traveling down a safe path here. This is music for the forces of darkness my readers. Mommy will not like you listening to this . Barshasketh have much of what made likes like Candlelight, Misanthropy, No Fashion and Osmose Productions come to the forefront of the black metal scene in the 1990's . This unit pays tribute to the days when it meant something to be Occult Black metal.. Madness is a good place to start with Svarta. This is violent hateful Black metal that is coming straight at you with no hope, vision of dreams of things that are going to be ok and then around the next corner Svarta is a Post Black metal force that could rival bands like Manes, Code, DHG, Ved Buen Ende etc. We have two very manic sides of a war like force coming together to make something as unusual and disturbing as any release I have heard before it. You know that this label offers and nothing is what it seems so I should always that that into consideration with each album. There is something very sinister afoot here and with each moment I listen Svarta draws me closer to there wonderfully corrupted abyss. You can hear the Pain and Torment in every moment of every track here. Sepultus is a journey to expel what every darkness they can on this dying rotting world. So some of you must know how I feel about the soundscapes know as Industrial Black metal especially when the come from places like Sweden or Norway . Well Diabolicum are from Sweden and its been over a decade since we last heard them. The band is taking on the 21st century with a frontman of none other the Swedish Dark metal masters Shining. There is nothing here but machine sounds, destruction, power and the drive to roll over all that is in front of them. There is not one thing that makes this band not impressive on all fronts from the way La Pazuzu is productions to the arrangements and the loops and samples that are layered through out . Diabolicum is a warship of heavy armor and aggression. Words are just words to this album. We have a must listen here for anyone that wants to here the next level of experimental sound mixed with the Black metal ideals in highest of regards..
A Duo from the state I live in Arizona playing some of the most off the wall Post Black Death/Doom metal with heavy Progressive , Jazz and Math Rock elements all into something that could very well be the post black metal Pelican or Isis as this is what I hear ripping out of these speakers. They remind me a lot bands like Shining (from Norway) and Rosetta. The Complexity and level of playing here is just second to know . Tempel are all about the music this is sans vocals and they are not missing at all. We have a mighty might soundtrack of extremes, Textures, Passion and Might . With each track and listen the band great to be more impressive and you will hear this as well. What else can really be said other then think outside the back and get Tempel new release !!!! There are moments were the occult takes you to places and you hear sounds that you know the ancient ones are speaking through you and with Temple of Gnosis I feel this is the level we are begining with . 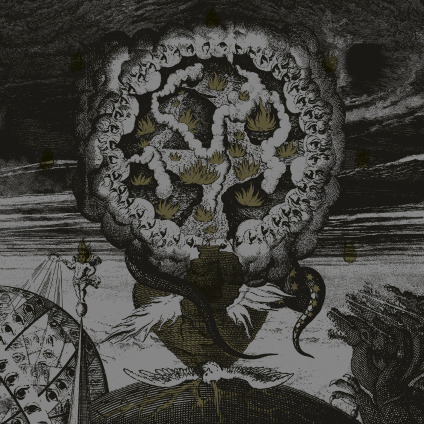 If Nile, Endrva, Thergothon and Godflesh were in one band we would would have something very similar to Tempel fo Gnosis. There are equal parts of Black Ambient, Doom/Death and Occult Death metal going on here in ways that no one will every be able to truly speak of . We can just give you a feeling or a taste in words of how massive and awe inspiring a band like Temple of Gnosis are. You need to step in front of this project and witness the power that is coming from their sounds and practices. I could go on all day on how each track is a ritual for the band and for those that listen to them . That with each passing song you learn something new about the world, yourself and all those around you. Simply let the Elder Gods speak through Temple of Gnosis to you..